Simplifying retail, one tap at a time. With EZ Touch your retail experience will come alive with speed and flexibility. Utilizing Marketplace Automation's powerful infrastructure, your business can generate powerful reports, indicating where your money is going, but more importantly where it is coming from. Whether your business is large or small we can help you. We take pride in being able to modify our software to fit your specific needs. We even have an iPhone/iPad app. Whether you have an iPhone, iPad, or iPod Touch we've got you covered. With MA Mobile updating your inventory is only a couple taps away. Quickly scan barcodes with a scanner peripheral or camera. Walk through your store, scan an item, set its sale price... its really that easy. You can even take pictures of your entire inventory. The app can also be used to keep track of purchase orders. When the shipment arrives, scan each item to update your quantities on hand. Anywhere you have an internet connection you can micromanage your store. 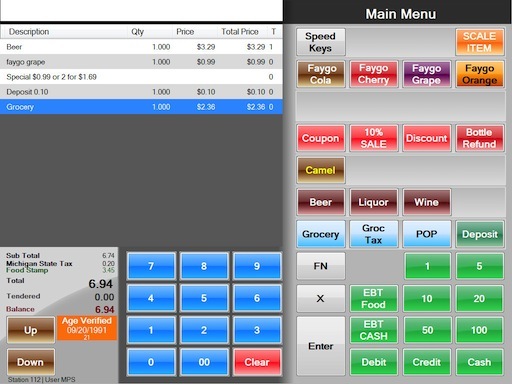 When you make a change in the app it is *immediately reflected on the POS. *The only exception is adding an item to inventory, a user will have to log out of EZ Touch for new items to be loaded into memory.